Seventh grade was supposed to be fun, but Tori is having major drama with her BFF, Sienna. Sienna changed a lot over the summer on the first day of school she’s tan, confident, and full of stories about her new dreamy boyfriend. Tori knows that she’s totally making this guy up. So Tori invents her own fake boyfriend, who is better than Sienna’s in every way. Things are going great unless you count the whole lying-to-your-best-friend thing until everyone insists Tori and Sienna bring their boyfriends to the back-to-school dance. 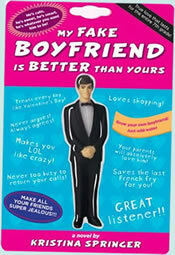 My Fake Boyfriend is Better Than Yours was so cute and such a quick read. Tori hasn't talk to her BFF in a few weeks and is worried that their friendship will be over. That is until she comes up with a new idea. I think that is reasonable to what happened in middle school. The plot surprised me with a few twist and turns, but was mostly what I expected from this book. If the book was longer, I would have expected a bit more suspense. It was pretty authentic for a middle grade book. I also like Springer's sweet, yet realistic voice that Tori had. I would recommend this book to fans of The Espressologist or realistic Middle Grade fiction. This looks cute! :) I just added it to my goodreads.